Lots of cowboys wearing pink here in Calgary. I know it's for hooter cancer support, but can you imagine all the real cowboys? "Tough Enough to wear pink" is the slogan. 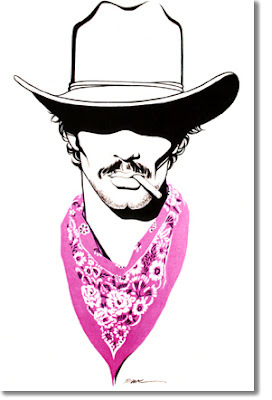 If you're a part time executive cowboy, and you think you're tough enough to wear pink then more power to ya'll.. but if your a grit eating, tabacco chewin, cattle ropin, bull back ridin, womanizin, red neckin, REAL COWBOY..... you probably don't wanna wear pink. You are just afraid of what people will say. I was wearing pink, my cowboy hat and my 'stache when I went to pick up my parents from the airport tonight. A real man will wear what he wants when he wants, and if anyone has anything to say about it, you can come to my place and say it to my face and then see what happens. I wear pink and am DAMN proud of it!! And anyone who thinks I am not all man can kiss... both sides!!! How was the movie?? Worth going to see?? Or is it just one ad and propaganda moment after another? You're not reading my bit. You're not a cowboy, so more power to ya. The GM Commercial er.. Movie was good.. but the action was too close. I always found myself wanting to see a zoom shot of the action. It was like watching a boxing match from six inches away. Hard to see what was really going on. I would say.. wait for DVD.